COTTAGE - Willowbank Cottage - 1 bedroom two story cottage with fully equipped kitchen/lounge area with wood fire heater and gas heater. Bathroom has shower/sink/washing machine and a separate toilet the bathroom. Our dog friendly area is the fenced deck and a small patch of grass with a large dog coup. The fence and the deck fence is 4 foot high. It is dog proof if you dog cannot jump over 4 foot. MINIMUM BOOKING 2 nights. Configuration: upstairs is the one bedroom and downstairs is the kitchen/lounge/shower/toilet. The cottage is set on a quiet lane with elevated bush views and only a 10 minute walk down to the main street which consists of shops on one side and beach on the other. Drive into the middle of town and turn right in to Williams St. off the Great Ocean Road also called Mt. Joy Parade. Going up the hill on Williams street take your 3rd major left where you will see a blue sign saying Cherry Tree Ck. cottages. After you take this left drive only about 60 feet and take you 1st right-this is Babingtion Lane a 'no through road'.. Drive slowly down this small section of road.. Willowbank is 4th on the left from the corner and is a red trim weatherboard cottage just before the willow tree. DOG RULES: Dogs are allowed inside, but not left inside alone if you go out. They must either go with you or left in the designated dog yard. No dogs on furniture or beds! Please keep out of the bedroom if possible. All dogs must be taken for a ''toilet' walk before the come into the house after their trip down and doggie poos are to be bagged and thrown in garbage bin. Please bring doggie stuff: beds, old towels to wipe them off. You must pick up all doggie poos. GARBAGE: We also recycle garbage here in Lorne. Yellow is for recycle and plain dark green is for garbage.. Thank you. 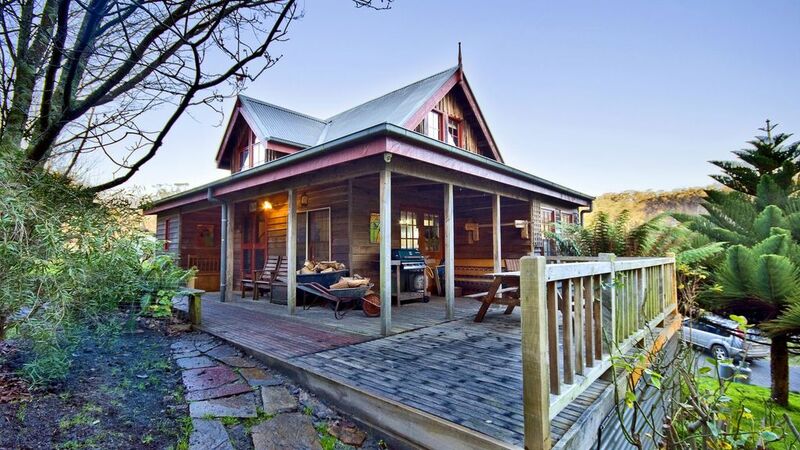 Quaint cottage in bushland setting. We had a great long weekend stay here and the hosts were very welcoming and friendly. The log fire was very welcome on those unexpected cold nights. It’s great to find such a gem and for it to be dog-friendly too. Highly recommended. This was our second stay at Willowbank and again we loved our time here. The cottage is well-equipped and a great place to holiday with our dog. The fire was lovely on the colder evenings and the sunny deck is a great place to relax and enjoy the bush setting. Just a short walk down the hill to the beach (a good workout on the way home) makes the cottage really convenient to town. Ed is a great host. We will no doubt be back. This property didn't disappoint. The surrounding landscape is incredible considering it is so close to the town of Lorne. Peaceful and ridiculously relaxing. I especially loved the feeling inside the house. Very different from your 'normal' plaster board interior of a house. We stayed for 4 nights and we didn't turn the tv on once which is an incredible testament to the house. Reading in different spots looking out fabulous windows at different heights and sizes was a delight and sitting in front of the log fire was a fabulous way to end an evening.